Energy is an area where materials technology will play a particularly important role in meeting the needs of the future. The high priority of energy makes it important to sustain research, development and modelling of materials for energy applications. - The UK should set out to recover, capture and develop the knowledge-base of high integrity structural materials for future power generation. - The UK should examine transferable material solutions and methods across the complete energy portfolio to attain maximum competitive advantage. Based on an independent study which it commissioned to review both the business opportunities and the UK's R&D capability for the civil nuclear sector the Technology Strategy Board has announced that it will be investing up to £2m in feasibility studies (up to a maximum of £150k each study) to stimulate innovation and strengthen the supply chain in the area of nuclear R&D and its application. The events are all free to attend. The competition is looking to engage SMEs from a broad range of sectors together with existing major players in the nuclear sector or potential new entrants into the market. The SMEs may have technology ideas or products that they feel could be applicable to the nuclear industry, but need further development, analysis or assessment to take them to the next stage. Research providers such as universities and RTO's are also eligible for the competition. Dechema e.V. have announced that the First International Conference on Materials for Energy will take place at the Convention Centre, Karlsruhe, Germany from the 4th to the 8th July 2010. A flyer for the event can be downloaded here in PDF format. The Energy Generation & Supply Knowledge Transfer Network (EG&S KTN) is a completely new KTN and will be launched on 13th October at Innovate 09.
featuring ministerial and senior industrial panel members. discussion throughout event. Further details, including on how to register, can be found at http://www.innovate09.co.uk/home.aspx. 2009 Low Carbon Transition Plan. hydrogen and fuel cells, maximising oil & gas resources and future emerging opportunities. until the launch of the full site. The Royal Society has published a report of a discussion meeting held at the Royal Society in June calls for a new vision of energy generation that is based on the long term replacement of fossil fuels through the development and deployment of new technologies. Longer-term transition: advanced energy storage and delivery technology to allow the wide spread use of intermittent energy from wind, the sea and the sun and potential deployment of nuclear fusion. The roadmap document as well as several other presentations from the event are available on the site link above. This event was held at the RSA, London on the 22nd June. The aim of the event was to help to implement the Strategic Research Agenda of the Energy Materials Group by prioritising technologies based on business cases; assessing where the technologies lie in the funding landscape; identifying who are the appropriate funders and maintaining the profile of the Energy Materials Group. The event took the form of a Dragons Den with each of the energy technologies having 15 minutes to present a business case to the five Dragons from Carbon Trust, ETI, Technology Strategy Board, EPSRC and Regional Development Agencies. The Dragons were then give 15 minutes to question the presenter and then voted as to whether they would fund or not. The audience then had the opportunity to vote as to who should be the primary funder and who, if anyone, should fund research jointly. The presentations from the event are available to download in PDF format below. Following the launch and publication of the Materials UK Strategic Research Agenda (SRA) for Energy Materials in December 2007, this 2 day conference was held on 9-10th October 2008 which highlighted the vital role of materials, and the progress made to date, in meeting the challenges identified in the SRA and in tackling climate change. The presentations from the event are available for download in PDF format below. Following on from the Energy Materials Strategic Research Agenda reports released in 2007, Professor George Smith writes in the March issue of Materials World Magazine about the future of nuclear power in the UK. He reviews the UK and Global status of nuclear power as well as the technological challenges and opportunities for the UK in developing and building new nuclear installations. The article is available to download here in PDF format. Following the successful launch of the Strategic Research Agenda for Energy Materials, Materials UK, with the support of meta4 , the metals and alloys node of the Materials KTN,	held a dissemination event on the status of the supply chains for the UK Power Generation Sector. 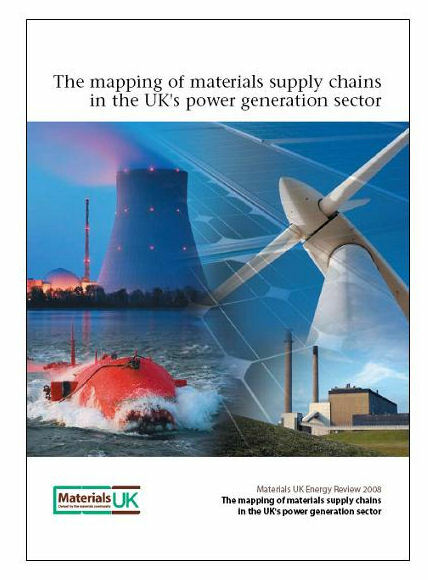 At the event the findings of a report commissioned by the Energy Materials Working Group of Materials UK: "The Mapping of Materials Supply Chains in the UK's Power Generation Sector" were presented. The presentations from the day are available for download below. The July issue of Materials World features a number of articles on Energy and Materials for Energy. The Energy Materials Working Group has published its plans for developing its Strategic Research Agenda and deployment plan in an article written for the July edition. George Morris of QinetiQ explains why materials are important for energy technology developments. The UK’s National Physical Laboratory is stepping up research to create commercially viable fuel cells. Imperial College London, UK, is at the forefront in energy materials research. The Government today published its White Paper on Energy. A full copy of the document is available for download here. Also available is a copy of the transcript of the Rt Hon Alistair Darling's speech. DTI Conference Centre, 1 Victoria Street, London. This meeting was held to disseminate the terms of reference of this Group and more importantly launch Task Groups which will embrace the wider materials community involved in the Energy Sector and obtain their input into the UK materials requirements relating to Energy generation, storage, transmission & distribution, conservation and security of supply. The presentations from this Town Meeting are Available for download below. Please click on the links to download the files.